Loads of customization options for both components and aesthetics. The Neuron comes in many high-end configuration options at reasonable prices, and our review unit is no exception—but if you like your PCs dead silent, it might be a little too loud for your taste. Building a PC yourself means being able to customize it specifically for the games you want to play, whether you’re a causal player or a full-time streamer. But if you can’t build your own for whatever reason, then where do you turn to get something completely custom? Origin’s all-new customizable Neuron gaming PC is yet another option for gamers and streamers who want a PC built their way, but don’t want to fuss with some of the more time-consuming aspects of building one. Dimensions: W: 6.75" H: 16.25" L: 15.0"
The Neuron comes in many different configurations, with the CPU up to either an Intel Core i9-9900K or an AMD Ryzen 16-core Threadripper, and the GPU up to a Nvidia RTX 2080 Ti. You can also get up to 64GB of RAM if your heart desires. 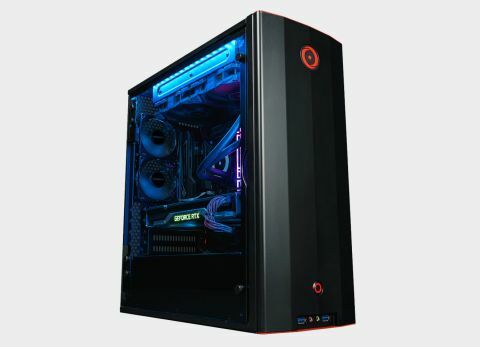 The unit we tested is a little different from the one in the photos; it’s red and sans RGB lighting, but it’s got a great list of components that include an overclocked AMD Ryzen 7 2700X 8-Core (4.3GHz TurboBoost), and one overclocked 8GB RTX 2080 Founders Edition. Some configurations can hold up to two GPUs, although ours only had one. In terms of customization, Origin offers HD UV glass printing and laser etching on all of its models, and the Neuron is no exception. Love Fornite a little too much? You can send Origin your best screenshot and voilà—the tempered glass on your case now has an image of your best in-game moment on it that you can see all the time. I’m sure you could get a picture of your dog etched into the glass if you wanted to, as well. The rounded edges on the front of the case does give it a bit of a dated look compared to the clean, sharp lines of many of today's best cases. Looks aside, the MicroATX case is not only compact and lightweight, but it can also be oriented sideways and upside down, which could come in handy if you have a unique desk set-up. The feet are magnetic, so it’s easy to change the orientation of the case. The tempered glass side panel swings open on metals hinges, with two simple magnets to hold it closed. No more fussing around with screws or aligning tabs between the case and panel. There’s even a small grove at the edge of the panel so you can open it without getting fingerprints on the glass, and the hinges are sturdy, so the panel won’t shut by itself. Performance-wise, this Neuron build spits out expected benchmark scores. Cinebench puts multicore performance at an average of 1,845, and 3D Mark churns out scores of 20,850 (1080p), 12,650 (1440p), and 6,715 (4K). In all, it’s still slightly an overkill system for gaming in only 1080p. According to in-game benchmarks at 1080p on ultra, Shadow of the Tomb Raider sees an average of 109 fps and Total War: Warhammer II sees between 81 fps and 100 fps, varying between battle, campaign, and skaven modes. Ghost Recon: Wildlands, of course, saw a lower fps at 73, but it’s a graphically intense game, as the GPU usage was pushed to a high of 96 percent. Given that this Neuron build comes with an overclocked Ryzen 7 2700X, it’s no surprise there’s an all-in-one liquid cooling system to go with it, but it’s noisy. There’s a brief quiet moment after you first start it up, but the low and aggressive whir becomes constant, only revving higher the harder you push the system. Most of the noise comes from the fans on the all-in-one liquid cooler, and it seems like that’s how they sound naturally. If this was a dedicated gaming PC and you only use headphones while you play games, it’d be easy to tune out. You can change the fan settings in the BIOS, which makes the system quieter, but it still emits a loud hum. (Our unit was set to PWM mode out the box instead of DC.) Considering there are other quieter systems on the market with the same or similar specs, it’s a sour point in an otherwise fine system. This system did run on the warm side during our entire benchmarking process, directly behind where the CPU was placed on the motherboard. Going back and playing Shadow of the Tomb Raider for a period of time made the case lukewarm. I took a look at the internal temperatures in HWMonitor. Without a game running, the CPU was a static 31 degrees Celsius without a game running. Running Tomb Raider for less than ten minutes rose the temperature to 41 degrees Celsius—still well within a normal range. I was unable to duplicate the same amount of heat even with running all the benchmarks again, however, so I’ll chalk that up to a weird quirk after booting up the PC for the first time. What usually separates one custom PC manufacturing company from the next are the services they provide after the PC has been built and shipped to the customer. Origin offers a lifetime service agreement, which includes free upgrades and repairs to your system. Origin also offers a trade-in graphics card program to reduce the cost of the new GPU. (Although on the model we received there is no part upgrade service included.) It’s these strides in customer service that can make one service more enticing over another, especially when every PC manufacturer offers the same builds at similar prices. Origin will also overclock your system for free and offers 24/7 U.S.-based support. This unit will set you back $2,490, which is about in line, if slightly more, of what it would cost to build the same or similar PC yourself. With so many custom prebuilt options to choose from, saving time and the headache of cable management might be worth the extra cash—and the extra-mile customer support.